It's official, school is back in session. I watch the cats suspiciously eye the hush that has settled over the house as I sip my coffee. Although I think it's too soon for school to be back in session (I'm an after-Labor-Day cheerleader), it is nice to fall back into a routine after a loose summer. I would like to say that routine includes popping doughnut holes in my mouth while formulating recipes and writing stories to accompany them, but it doesn't. And truthfully, that's a good thing. One (me) can only handle doughnuts sporadically these days. So really, it's more likely that doughnuts will happen on the weekend when people besides me are home to eat them. 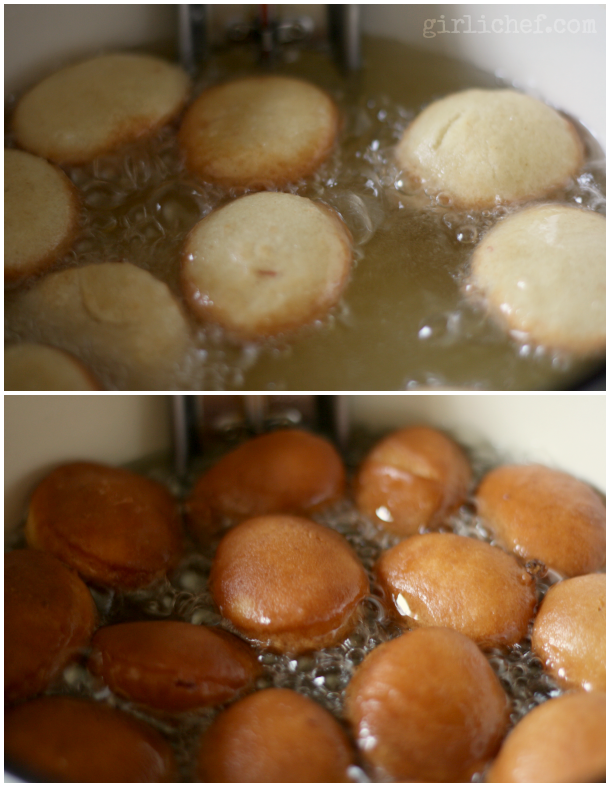 Case-in-point, these little fried dough balls of delight. 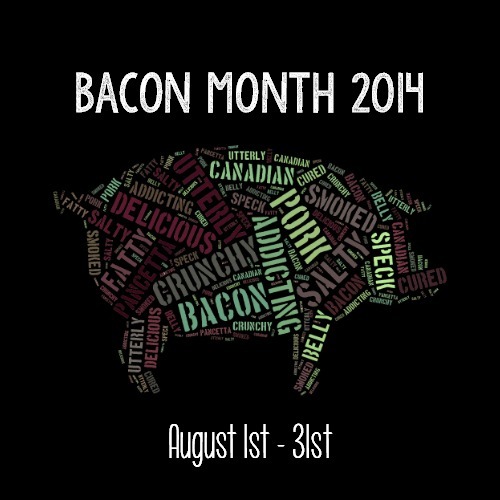 Basically, they're raised doughnuts infused with real maple syrup and bacon. 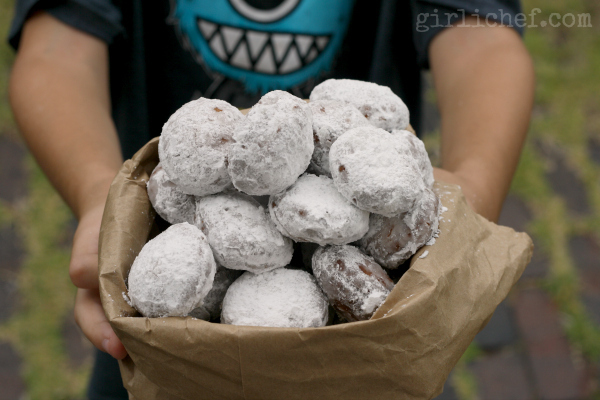 After you fry them, you drop them into a snow drift of powdered sugar and shake. The result is nothing short of dangerous. 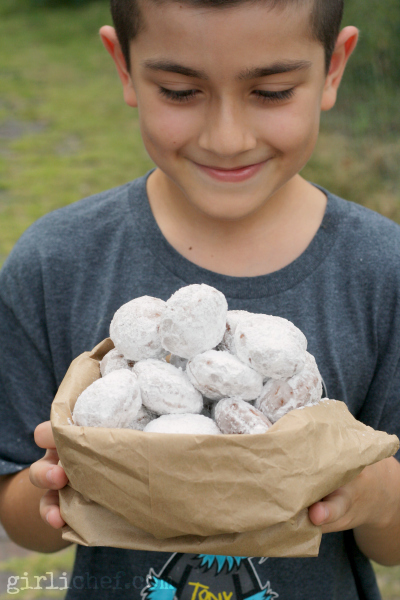 When you pick one up, your fingers sink into the powdered sugar, that betrays the fact that it's melting into a sticky glaze where it met the hot doughnut. 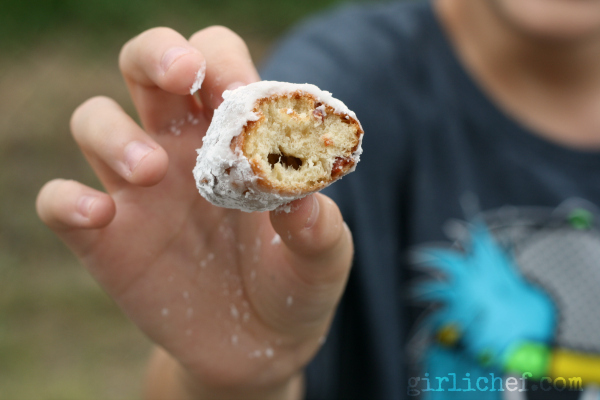 Although you can clearly see that it's a powdered doughnut, your mouth forms the question as to whether it's actually glazed. Basically, it's the best of both worlds. So yeah, it's a very good thing that I made these while there were still many hands hanging around the house to grab them before I could. They were definitely a crowd-pleaser, so I recommend making them for a crowd. Doughnut holes scented with maple syrup and studded with bacon, then rolled generously in powdered sugar. Place all the ingredients for the dough into the bread machine in the order listed. Select dough cycle and let it mix and knead the dough. The dough should be slightly sticky, but still cleaning the sides of the bowl/pan. Turn out into a lightly oiled bowl, cover with plastic wrap, and allow to rise until doubled in size, 1-2 hours. Punch the dough down and turn out onto a lightly floured work surface. Roll out to about a 1/4-inch thickness. 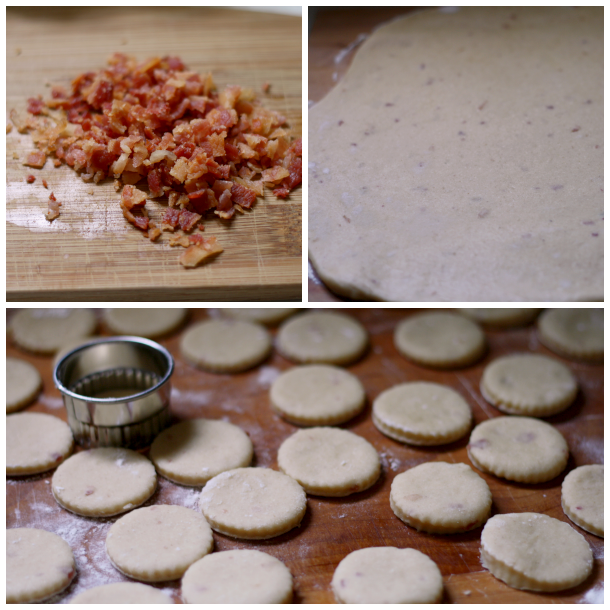 Use a 2-inch biscuit cutter to cut out circles. Transfer the dough to a couple of baking sheets that have been lined with parchment or wax paper. Cover loosely and allow to rest for 30-40 minutes, or until risen. Heat a couple of inches of oil in a heavy pot until it reaches 300° F on a candy or deep-fry thermometer. Set some wire racks over some layers of paper toweling. Fill a brown paper lunch sack a few inches high with powdered sugar. Very carefully add dough to the hot oil, taking care not to crowd the pan. Fry for 2 minutes or so on each side. Use a skimmer or slotted spatula to remove the doughnuts from the oil and set them on the wire rack to drain. After a minute or so, drop the doughnuts into the powdered sugar, fold the top closed, and shake until coated in sugar. Return the doughnuts to the wire rack to continue cooling. Bring oil back up to temperature and repeat as many times as needed until all of the doughnuts are cooked. Replenish powdered sugar, as needed.